We’re still catching up and feeling motivated after an action-packed 2 days in Plano, TX! 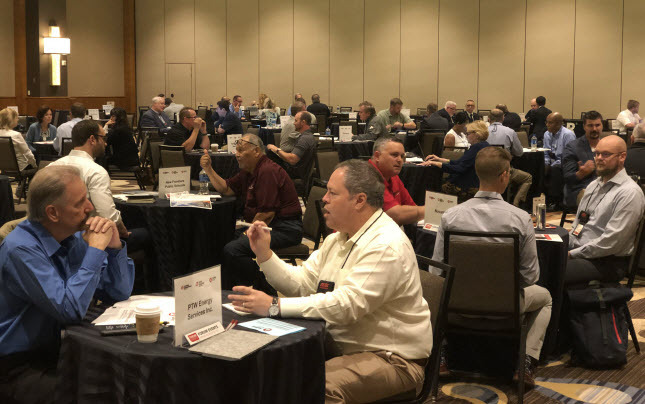 The Total Security Summit, Safety Forum, and Facilities Management Forum took place from June 25-26, 2018 at the Dallas/Plano Marriott at Legacy Town Center. The delegate executives in attendance came from leading companies and organizations across the country including AbbVie, American Girl, Behavioral Hospital of Bellaire, Freeman, Harbor Pipe & Steel, Novartis, Office Depot, Starbucks and more. Following the opening reception and dinner on Sunday Night, Monday morning kicked off with our one-on-one meetings, the heart of our Forum Events program. There were 27 solution providers at the joint event to meet face-to-face with executives to discuss the latest technology and services to help delegates meet business demands. Based on the feedback we’ve received, we can say that these meetings were very successful, both for the delegates and solutions providers. “This was our first time to a BLR Forum Event; I guarantee you that it won’t be our last! This format was so much more focused on our interests and needs and was extremely productive for us compared to the strict exhibition/expo style conference…Kudos to the Forum Event team for an outstanding, enjoyable event (Casino night was the greatest! )” – CEO of AlgEternal Technologies, Inc.
“Great event – well planned and organized. Immense opportunity to network with peers and the workshops were informative and thought-provoking. The ability to select and have designated time with vendors was extremely productive. My first time attending, and I would attend again as well as recommend to colleagues.” – Safety and Worker’s Compensation Specialist at DAVACO, Inc. 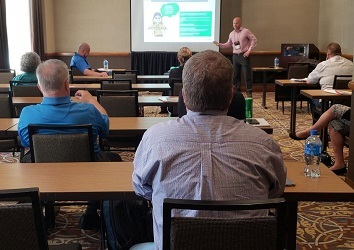 The CSO of Everbridge, Tracy Reinhold, walked us through how building relationships with other executives can make security officers more effective in their roles. Beyond all the meetings and workshops, there were plenty of opportunities for networking and fun. The 3 catered meals and cocktail receptions each day provided a great opportunity to continue conversations with vendors, connect with other delegates, or simply meet new people. The casino night, a staple at Forum Events, gave everyone a chance to relax and have some fun. Oh, and win prizes! Derek Pinnock of Freeman came in first place and walked away with a $250 gift card from Marriott! Runner-up, and winner of a $100 Marriott gift card was Mike Bosslett of Pioneer Properties, LLC. If you missed out on these particular Forum Events, never fear. The next round of events is going to be held in Boston on November 12-13, 2018. If you are a manager, director, or executive with a project in the pipeline that you need solutions for, one of these events will be a great opportunity to meet with colleagues in similar positions and source solutions.